This classic wagon is filled with gifts that say “Welcome Sweet Baby.” It’s a gift that’s sure to be remembered. The Welcome Wagon includes a 12” plush bear with hat, a plush moon toy, a “beautiful baby” embroidered bib, and a tiny plush bear along for the merry ride. Soon the tiny tot will be pulling the wagon. Measures 13”L x 9”W x 16”H Arrives wrapped in a cello bag with a ribbon bow. Girl includes plush bear wearing fancy pink pouf hat. Boy includes plush bear wearing baseball cap. 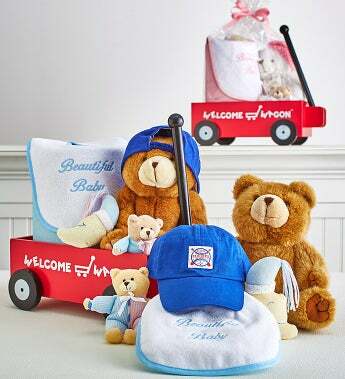 Greet baby's arrival home with this classic Welcome Wagon Gift Set.